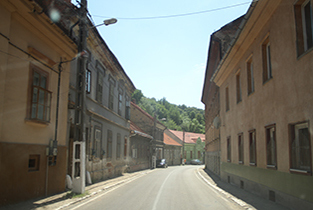 The old town of Oraviţa is located in a narrow valley which opens towards a plain. Oraviţa used to be the administrative centre of the Banat Mountains for 150 years. Already the Romans knew about and used the precious metal and ore reserves in the area of Oraviţa. It was the Romans as well who built fortified camps around the mines for their legions. Miners from Tyrol, who had come to the then still Ottoman – region shortly after the Treaty of Karlowitz (Sremski Karlovici) 1699 to search for ores, were a first sign of Habsburg’s interest in the resources around Oraviţa. In 1718, a mine captain and 105 miners from Habsburg lands came to Oraviţa and established the first mines. These were so profitable that more workers were needed. The potential for that lay beyond the Iron Gate of the Danube. 3.000 Romanian families – many of them runaway bondslaves – were recruited to work in the region around Oraviţa. The relationship between locals, the specialist from Western Europe and the resettlers from the Ottoman Empire must have been not too bad. This can be seen in the fact that the Germans of the Banat Mountains call the native Romanians “Fratutzen” (from “fratuli”, little brother). This term is said to have come from Oraviţa. In 1723, the Upper Mining Authority was brought to Oraviţa as well as the mining court and the regional administration. First smelting furnaces and two water reservoirs for coolant are built. In the second half of the 19th century, the centre of economy in the Banat Mountains moved towards Reșița which weakened the administrative power of Oraviţa. This tendency was furthered by the massive privatisation efforts of the previously state-owned economy. Oraviţa developed from a small town with a solid middle class interested in culture to a city of burgeoisie and retirees. A building which holds a theatre and a casino (in which the first reading and singing society held their meetings) was financed through an effort of Oraviţa’s civil servants – through all ethnicities – and was inaugurated in 1817 in the presence of Emporer Francis I. It is modelled after the Burgtheater in Vienna und holds an important role in the cultural history of the multicultural and multiethnic city. 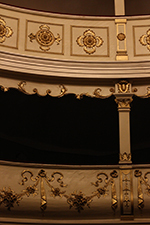 Musicians like Liszt, Strauß and Bartók gave performances here and theatre groups played in several languages: German, Hungarian and mostly Romanian. Furthermore, local amateur artists were given a chance to show their talent. The theatre has an impressive collection of theatre and performance posters which are sometimes trilingual. 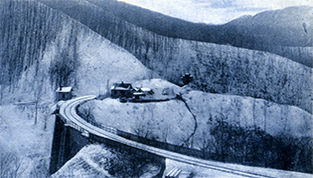 The first railway line of the Region ran from Oraviţa to Buzias in 1847. Narrow alleys reminiscent of the middle ages lead from Oraviţa uphill in the direction of the sanatorium Marila and Anina. LEFT: The Roman Catholic church of Oraviţa, consecrated in 1724, is one of the oldes in Banat and preserves the air of baroque architecture. 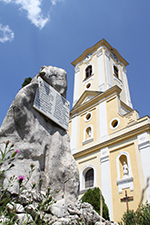 In 2004, a bilingual memorial in Romanian and German was erected “in memory of Empress Elisabeth”. RIGHT: Detail in the old theatre in Oraviţa.